The Lemon Shark is the best known and most researched of all sharks. It belongs to the Requiem shark family. They got their name because of their unusual yellow-brown skin color. They live in subtropical waters along the coastlines, mostly in mangroves, coral reefs, and river mouths where they can hunt a variety of prey. They are generally found along the coasts of North America and South America, in Pacific and Atlantic oceans. They are also known as the Negaprion Brevirostris. The Lemon Shark is known to return to specific nursery sites for breeding. The average lifespan of these sharks is approximately 25 years in the wild. They are average sized and they usually grow to 7.9 to 10.2 feet in length. On an average, adult individuals of this shark species can weigh approximately 90 kilograms. They have poor eyesight. This is the reason why they rely on electroreceptors in order to find their prey. They are carnivorous and choose abundant, intermediate-sized prey, preferring bony fish to cartilaginous fish, crustaceans, or mollusks. They have very complex mating rituals and tend to congregate in mangroves every two years to reproduce. The birthing cycle of this species lasts for one year and they give birth to 5 to 20 pups at a time. 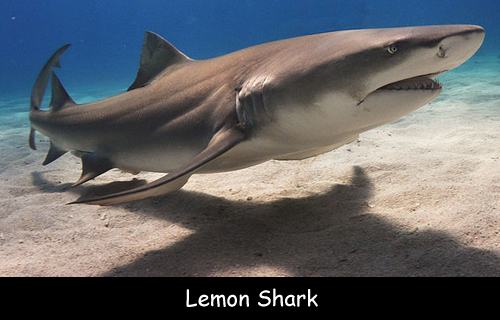 Lemon Sharks are generally non-aggressive towards humans. They are social creatures and primarily live in groups. These groups have complex social rules, dominance hierarchies. Declan, Tobin. " Cool Lemon Shark Facts for Kids ." Easy Science for Kids, Apr 2019. Web. 21 Apr 2019. < https://easyscienceforkids.com/lemon-shark/ >.